CVLUX — LUX Travel: Bali Vibes! White sand. Black sand. Turquoise waters. Fire-grilled seafood on the beach. Radiant sunshine. Swimming with turtles. Seaside massages. Coconut palms. Luxurious villas. Frolicking with monkeys. Awe-inducing rice terraces. Indulgent resorts. And all for far less that you would pay in most parts of the world. Does this sound like a dream to you? Well, dreams do come true in the form of Bali, just one of the 13,000+ islands in the archipelago of Indonesia, nestled between the Indian and Pacific Oceans. Yes, Bali was the final stop in Eat, Pray, Love, and it’s really no surprise why this was the place destined for romance. The Balinese are lovers of life, lovers of their land, and about as happy and at peace as any one culture could possibly be, making it the ideal destination to spend your first days of married bliss. As worshipers of the water, we chose to stay coastal for the majority of our trip. We began at the otherworldly Ayana Resort & Spa. Disclaimer: we’re not really “resort people.” But this place will either make you into a resort person or make you forget completely that you didn’t think you were one. Imagine yourself in an infinity pool, drink in hand, perched on a cliff over a private beach in Jimbabrin Bay as the sky paints itself every color of sunset, with eager staff just a wave away to indulge your every whim. As soon as we checked in, we went straight to the spa to invigorate some life back into our bones, having been cooped up on planes for the past 20 hours. I’m a major fan of massages and have experienced many different kinds, but the Balinese certainly do it best. With fluid, ocean-like movements, there is just something indescribable about their sweet style that lulls you into peaceful relaxation. Uluwatu makes a perfect day trip from Ayana, as does Seminyak. 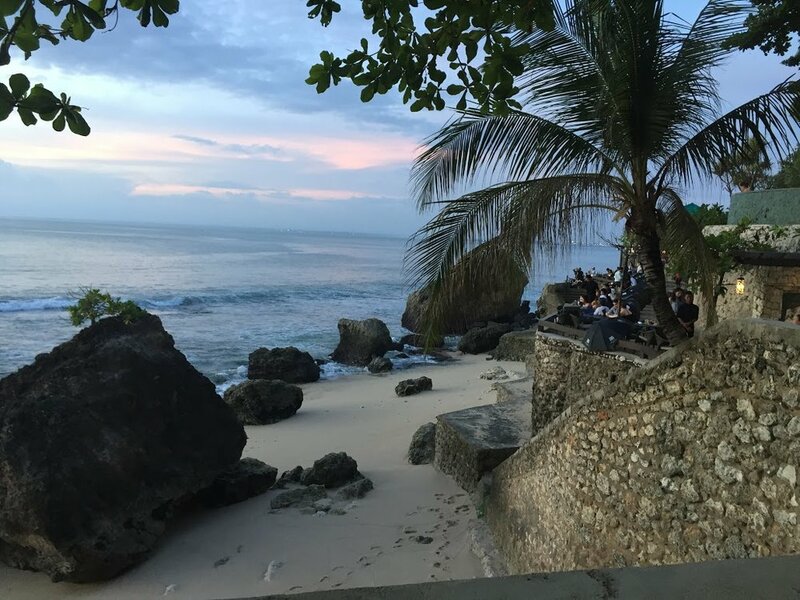 In each you will find fun places to have a drink, be it a typical fresh Balinese juice or a mischievious cocktail, and catch the sunset. Some favorites are Potato Head Beach Club, La Laguna, and Sea Circus. 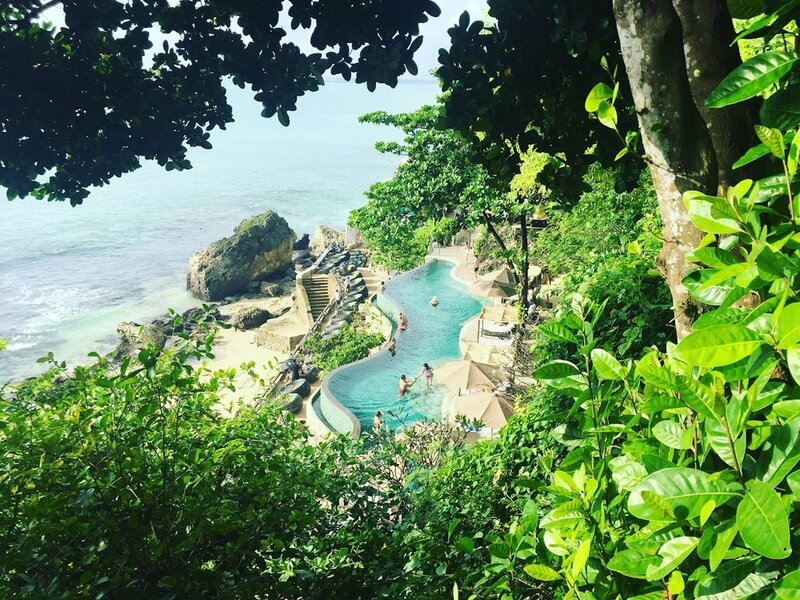 Be sure to make time for Uluwatu Temple for Instagram-worthy views. For the surf couples out there, a few days at Komune in Keramas has everything either of you could want: poolside beach club, front-row seats for world-class waves, a spa that offers a FOUR-HANDS MASSAGE (yes, you read that right! ), good eats and fresh juices delivered right to your towel without ever having to put your book down. There’s not much to see or do around town, so cuddle up and tune out. For a completely authentic Bali vibe, Canggu has it. This hippie surf town, although infiltrated with Aussie expats, gives you a true taste of Bali. Set in a backdrop of rice fields, there is nothing to do in Canggu but read, eat, drink, beach, shop and surf. There are some killer shops and eats, so hop on that scooter and explore away. Be sure to stop by Betelnut, Deus Ex Machina, Avocado Café, and Crate. A stop in Ubud, the island’s art and culture capital is a must, if even just for a day. For my fellow foodies, this is THE place. Stop by Ibu Oka for Babi Guling, traditional Balinese suckling pig, slow-roasted over an open flame, stuffed with herbs and spices, bathed in salted coconut milk, served with housemade sambal (a spicy lemongrass, shallot, garlic and chili oil). In other words, YUM! Save room for Crispy Duck at Dirty Duck Diner. Walk it all off at the nearby Tegalalang Rice Terrace for one of the most inspiring sights you’ve ever seen. If you are lucky enough to make it all the way to Bali, a trip to the Gili Islands is a must. Just a couple hours by fast boat will transport you to a completely different world. The three Gilis—Trawangan, Air and Meno—have absolutely zero motorized transportation. Everything is done on foot or by pony. The islands are so small they don’t even employ full-sized horses! 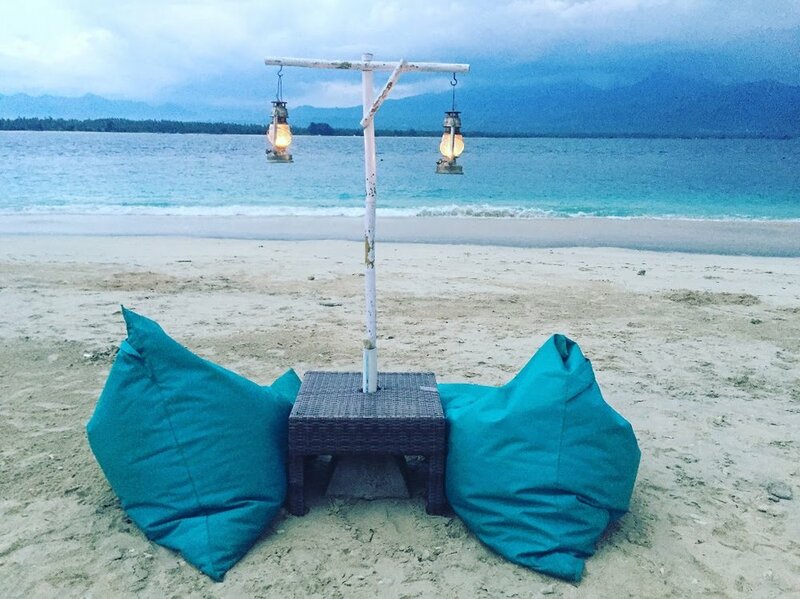 We chose Gili Air as it’s a perfect mix of civilized comforts and deserted-island feel. Take a boat out out for snorkeling or diving… the Gilis are famous for it. Dry off on land as you take in the sunset while dining with your feet buried in the bright white sand. This is just a snapshot into the world of wonder you can find in Bali. It doesn’t even cover every stop and adventure we had in just two weeks, but this is supposed to be a blog post, not a novel. Hop on Pinterest and believe me, the photos you see are REAL. And it really does look like that. But you need to feel it, smell it, and taste it for yourself. If good vibes are your thing, Bali is waiting.